This world is called Horodyn, so named for its first king. At the edge of a village surrounded by a huge forest lies the powerful stone Arcana, the source of all order in the world. It is said that only one with power can acquire Arcana. Slayers annihilate hordes of monsters so that they could lay their hands on Arcana. What power does it hold? And to what destiny is one with Arcana bound? Defeat tough enemies and obtain new items and skills with up to three friends, or take on a variety of quests in single-player mode in this multiplayer action game from Square Enix. 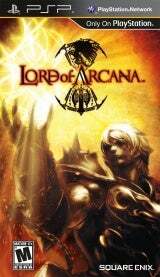 With its simple and intuitive controls, even those unaccustomed to action games can jump right into the fast-paced world of Lord of Arcana. Last edited by jibbz; 02-18-2011 at 10:15 AM. Is there a difference between this and the EUR release from January? This game sounds interesting. Is it any good? Good as MHFU? Ack. My EUR save file is not compatible with the USA version. I wonder if there is a way to convert it over rather than starting a new game. This game is kinda lame compared to Monster Hunter. The graphics feel more mmo-ish in the village spot. But then the quests and monsters are lacking in design. Less weapon-types, less items, kinda lame farming. But idk, maybe some people like having a light popping up for gathering nods. Why do they make the battles happen in a separate fighting ...zone? The best part is the music. The music is great. Shame it got shafted to a lame MH ripoff... If I could replace MH music with this music, I would be set. Lock-on... what so many people want for MH, yet here, it's not that great. Maybe because you have to hold the button, maybe because switching targets requires using the d-pad. I'm not sure. When fighting things that walk around, it doesn't really turn you around well. You'll get a hit off, go into a combo, and you'll miss have of the hits and you can't stop and switch facing. Coup de Grace's are fun the first, maybe second time you see them. Then... they're just an easy way to finish the fight. And those are my thoughts on this... I'm gonna try out the single long-range weapon now. Probably gonna be lacking along with the rest of this game. I have been playing this for a bit and I agree with slacker, while it's a fun and interesting game, it doesn't live up to MH in any way. I still like it though b/c S-E made it. Any game that company makes, is fine by me.